“Previously I did not have the chance to meet Dr Lee in person, today’s dialogue provided me the opportunity to meet her,” said Nur Sakiinah, a student studying BSc (Hons) in Accounting and Finance. “This is also a good opportunity to help establish and broaden my network with students from other programmes.” Nur Sakiinah is also President for the Secretariat of Rukun Negara (SRN), a student leadership club in Sunway which aims to promote unity in the community. Dr Lee having a chat with students after the session. Various issues were discussed and addressed during the session. Dr Lee expressed concern on students’ well-being and encouraged them to look out for each other. 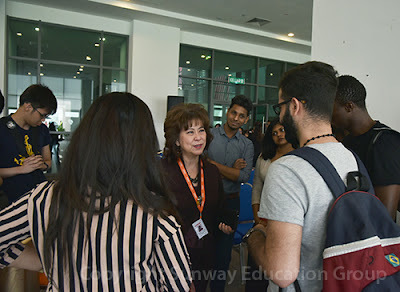 Dr Lee also encouraged the students to broaden their horizons by seizing the various opportunities available and to participate in the public lectures held at Sunway, especially the Jeffrey Cheah Distinguished Speakers Series (JCDSS). Other topics discussed include flexibility and availability of elective subject for undergraduate students, employability, on campus facilities and gender equality. The administrators and faculty, including Head of Departments of Sunway University and Sunway College were on hand to assist Dr Lee to provide extensive information and take note of all feedbacks and suggestions. The town hall meeting was jointly organised by Sunway Student Services Department and student leaders of Sunway University. Its main aim was to provide both students and staff a platform to foster closer relationships and to enhance students’ experiences in Sunway.